Our mission is to create global business opportunities and education for our members. The Global Business Council offers monthly educational and networking opportunities to expand the reach of business for HGAR members. The Global Business Council works with the Economic Development Agencies and other public and private sector entities to assist in expansion of investment into our market area. The Global Business Council oversees our Ambassador relationship with Portugal. The National Association of Realtors coordinates a sharing and networking alliance with real estate entities across the globe. HGAR has a formal relationship with the real estate professionals in Portugal, working with UCI and APEMIP. 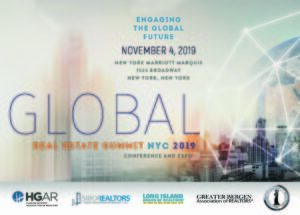 November 4th 2019: The Annual Global Real Estate Summit NYC at the New York Marriott Marquis.